Like many UK families my family is dispersed! We live in South London (not massively far from where I grew up), my parents have moved to Hunstanton on the North Norfolk Coast - or Sunny Hunny as they prefer to call it and my brother and his family have gradually moved north over the years and in their last move they made it as far as Peterborough in Cambridgeshire. That means a lot of our contact is on the phone or electronically rather than in person but that never seems to matter and we do all get together several times a year, so it's not a problem. This week started with my brother posting pictures on Facebook of his Malaysian beach holiday. Yes, thanks very much for that - we all know it's warm out there and the beaches are lovely... And it's not like that here... at the moment we're just happy if it doesn't rain! It continued with an online chat with niece #2 (the numbering is age related - she's the youngest at fifteen) who wasn't happy with her sister (niece #1) for changing her birthday on Facebook to that day, as she put it "because she thinks she's funny." Clearly niece #2 wasn't amused, less so I think when Grandad popped up on Facebook wishing her a happy birthday (and was no doubt put right by Nanny later on!). We ended our online chat on a completely different subject as I'd found a "beaded cat" in my desk which she'd made for me probably about ten years ago. 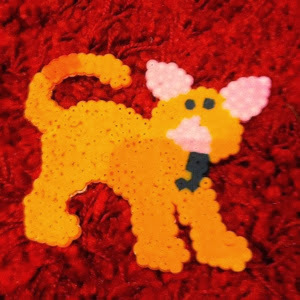 It's a reminder of my much-loved and long departed ginger cat and I remember when she presented it the tail was almost hanging off so we needed to do some running repairs with the iron (they're the beads that need some heat to fuse them together). Since then it's lasted well, as up until a recent desk move it'd been hanging on my desk partition. She however, had no recollection of this at all - isn't the mind a funny old thing? Then yesterday after a reassuringly meant message from my brother telling me niece #1 was ok and was mostly "annoyed someone tried to break in" the full family machine rolled into action. Speaking on the phone to niece #1 (who's twenty) it transpires that at 2:30am Friday morning she was woken by a loud noise, which on investigation was a brick thrown through their kitchen window. As she got downstairs hands were reaching through the broken window towards items on the table; she screamed at them and thankfully they left. She called the Police and they responded quickly and efficiently visiting and calling out someone to board up the window. Then she called her dad in Malaysia because she was stuck (and every girl knows their dad is the best person to call then), and her mum (whose about 20mins away) who arrived with niece #2 for an impromptu sleepover. Niece #1 said they all slept in the same room and agreed she'd done well to hear this as she sleeps "like a Robinson!" And last night Grandad was dispatched to stay the night and has reported an all clear on his watch - phew. He's back home now and niece #1 is under strict instructions to call any of us at any time of the night. My brother's still peeved that it happened while he was away.